Despite waking up ridiculously early the day before, my body clock decided that it was a great idea to wake me up at 5am again. As much as I was not happy about this arrangement, it did mean that I am now half way through my book (Good Omens by Terry Pratchett and Neil Gaiman if you were wondering). Once everyone else was up we had a breakfast of toast and eggs at the hotel and by 11am we had checked out and in the taxi, with the same taxi driver who drove us four times the day before! 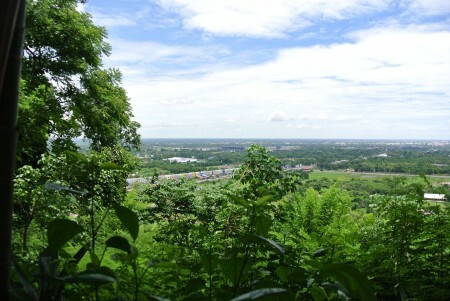 This afternoon we went to an extinct volcano called Khao Kradong in Khao Kradong Forest Park. 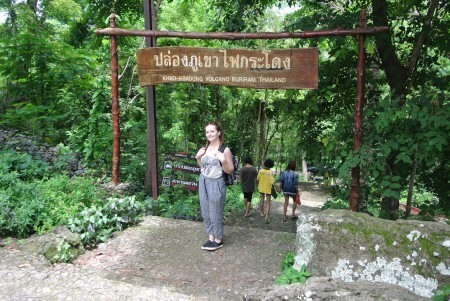 The driver dropped us off and we were presented with 297 steps to walk up to get to the extinct volcano. It doesn’t sounds like a lot but in thirty degrees Celsius in humid heat it’s a nightmare. But we made it. 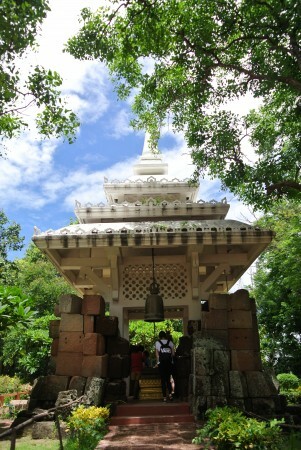 At the top of the hill there was a shrine that you could ring the bell of when you exited the shrine. People were standing in it trying to balance coins on different squares. By the determination on their faces I would guess that it was some sort of prayer to the Buddha. 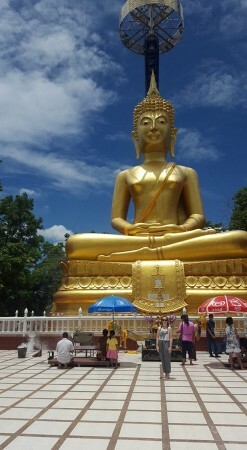 There was also a golden statue of the Buddha. We had to take our shoes off before we walked over to the statue; the floor was so hot that I was doing more of a waddle than a walk! We got some nice photos by the statue though. We then went to go look at the volcano. This unfortunately involved more steps. But thankfully we were descending them this time. When we reached the bottom (after a few breaks) we came across a place where people balanced stones on top of one another for good luck. Since we weren’t entirely sure what happened if you couldn’t balance the stones and the pile toppled over, we decided not to try. 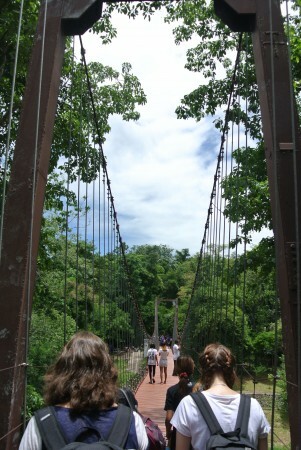 We continued walking round the extinct volcano, which is now a dip in the ground, and across a suspension bridge. It was a bit wobbly and I didn’t dare look below or move too quickly if the bridge decided to give way. But we made it across. 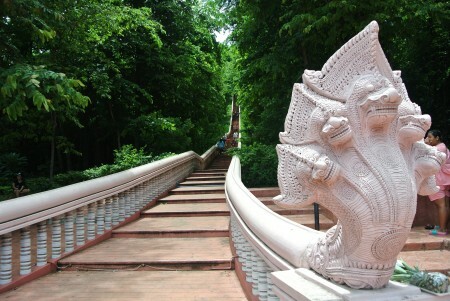 After making our way up and down the multitude of steps, we collapsed on a bench and called Aum to call the taxi driver to take us to the bus station in Buriram. And yes, it was the same taxi driver. When we got to the bus station we managed to secure tickets quickly thanks to the help of the staff there. It was a good thing too as the next bus was leaving in five minutes, at 1.20pm, the one after that left at 9.15pm. 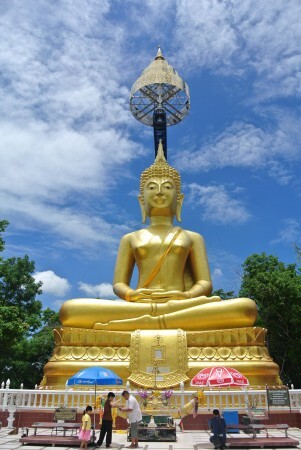 As much as Buriram is lovely, I think we were all looking forward to going back to Ubon Ratchathani.